Brill, Youth in a Globalizing World , , 290 p.
The aim of Protests and Generations is to problematize the relations between generations and protests in the Middle East, North Africa and the Mediterranean. Most of the work on recent protests insists on the newness of their manifestation but leave unexplored the various links that exist between them and what preceded them. Mark Muhannad Ayyash and Ratiba Hadj-Moussa (Eds.) argue that their articulation relies at once on historical ties and their rejection. 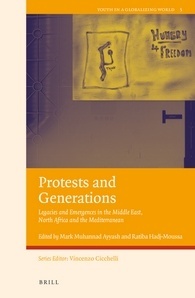 It is precisely this tension that the chapters of the book address in specifically documenting several case studies that highlight the generating processes by which generations and protests are connected. What the production and use of generation brings to scholarly understanding of the protests and the ability to articulate them is one of the major questions this collection addresses. Contributors are: Mark Muhannad Ayyash, Lorenzo Cini, Éric Gobe, Ratiba Hadj-Moussa, Andrea Hajek, Chaymaa Hassabo, Gal Levy, Ilana Kaufman, Sunaina Maira, Mohammad Massala, Matthieu Rey, Gökbörü Sarp Tanyildiz, and Stephen Luis Vilaseca. Mark Muhannad Ayyashis Assistant Professor of Sociology and Director of the Peace Studies Initiative at Mount Royal University. His recent publications examine examine Palestinian youth movements, theorizing violence, and the work of Edward Said. Ratiba Hadj-Moussais Professor of Sociology in the Department of Sociology at York University, IRIS research fellow. Her publications explore the new forms of the political, the margins, media and public sphere in North Africa, and laicité in France and Quebec. 1. Palestinian Youth in Israel: A New Generational Style of Activism? 3. Lawyers Mobilizing in the Tunisian Uprising: A Matter of ‘generations’?